Uppsala, Sweden: Day 29. Our journey continues, despite the heavy fog that has descended upon the city this evening, swallowing all sign of not only the cathedral, but indeed the buildings across the street; while pleasant in a Whitehall sort of way, it spells almost certain doom for our plans to view the lunar eclipse at 4am. Meanwhile, supplies brought along from America are now exhausted, so we are reduced to trading with the natives to meet our basic needs. We've managed to find sources for most necessities, but some are, sadly, lacking. The lactose-intolerant among us had a dicey couple of weeks there, when it looked like certain remedies, easily obtained over the counter in the US, were wholly absent here in this, the land that invented lactose-tolerance. Fortunately, the ready availability of probiotic drinking yogurt and fil helped to ease the transition, and a plethora of lactose-free dairy products can be found at all the markets (supplied, no doubt, for the convenience of any visiting Finns, who rank among the least lactose-tolerant people in the Western world). More lately, we have located a source of over-the-counter lactase enzyme, which while painfully expensive is, nonetheless, a welcome supplement. This weekend saw the end not only of our soap and shampoo, but also our laundry detergent, so we have begun experimenting with local varietals. So far, there have been no major incidents. The choice of shower soap was completely non-rational, but based instead on the fact that the company, LdB, recently bought the soccer team from Malmö (well, and the soap was on sale, too). Unfortunately, our quest for decent beer has been less successful. The local "dark" would best be described as an amber, and the rest of it were best not described at all. 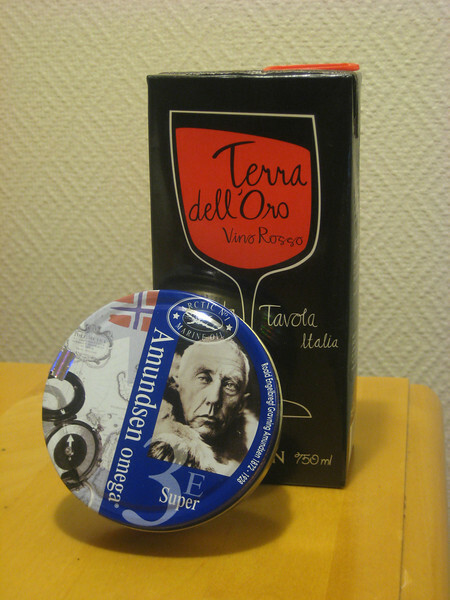 The tetrapak wine is something of an oddity, but we are trying to keep an open mind. Our stock of English language reading materials has been well supplemented by a trip to the city library; on the other hand, envelopes and file folders have remained elusive. At least we have an endless supply of fish oil. Is shampoo called "Balsam" there? Maybe there is good beer somewhere. People who come here think our bread and beer are horrible, but that's because they buy the cheapest thing at Krogers. Maybe there's something equally confusing there? I sent an email to the address at the bottom of the blog entries, which bounced. Please ask Jennifer to check her umich email! Lättöl (light beer, 3.5% alcohol) is sold pretty much anywhere, and is generally awful. Starköl (5% or 7% alcohol) is sometimes a little better, but is only available at Systembolaget, the state run liquor monopoly. The difficulty in choosing a starköl is that there isn't much of a price range: cheap, really bad beer costs maybe 12 SEK a can, and the market seems to top out at 14 SEK a can. There is, of course, a limited selection of imported beer, which would be fine, but the price on that goes up fast. Actually, except for wine, the selection on just about everything is limited at Systembolaget, at least the one here. There are a couple more locations in Uppsala, but the one we've been going to is the fancy, downtown store, so I'm not hopeful that the selection will improve. ot that we can afford to buy anything fancy, anyway! I think I fixed the mail link now (it does help if I spell the address correctly), but in the meantime Jennifer does check her umich account frequently.